Did You Ask For A Luxury Home For Sale Near Me? I have written several articles showing trends in the luxury home market in Tallahassee, as I consider it a very important issue to all Tallahassee homeowners. One search that we commonly see buyers perform is "Luxury homes for sale near me," so we know that it's a continual topic of interest. 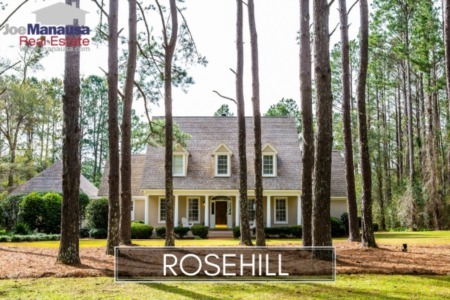 Today I propose to show our readers how and why they should be concerned with events at the upper end of the Tallahassee real estate market, as there truly is a trickle-down relationship for all of us. First things first ... what is the definition of a luxury home in Tallahassee (or any other real estate market for that matter)? The term "luxury home" is subjective in nature, depending upon your position at the time. When I was serving in the Army in the jungle in Panama, a luxury home had netting to keep the mosquitoes out. Nowadays ... I demand air conditioning :). So to create an objective report on the luxury home market in Tallahassee, I am going to focus on a price range that is restricted to the top percentage of the Tallahassee real estate market. I can easily create an objective report looking back at more than 20 years worth of sales activity and refer to it as the luxury homes market. In Tallahassee, we will use homes that have sold for $400,000 or more, and the graph below shows that it is very restrictive indeed. But other areas of the State or Country might need to use a higher or lower number. 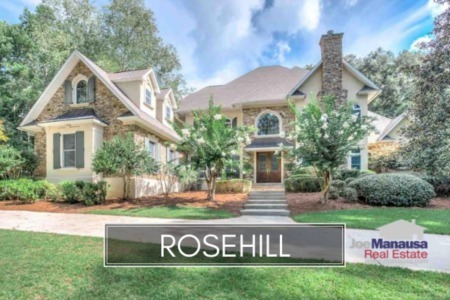 I suspect many California markets consider a $400,000 home as median or lower, but in the Tallahassee real estate market, $400,000 gets you a luxury home. The graph above shows the number of luxury homes sold each year (measured on the left vertical axis). Home sales are "stacked" by price range, with blue showing all homes sold from $400K to $599K, red showing all sales from $600K to $799K, green measuring homes sold from $800K to $999K, while purple records homes sold for $1M or more. Simultaneously, the black line shows the average mortgage interest rate each year (measured on the right vertical axis). The first thing that really jumps out to me is how home sales over $400K hardly existed in the early 1990s, but by the peak of the housing market boom, they had grown by 6517%. Yeah, that’s not a typo, I’m talking six thousand five hundred and seventeen percent! Even 2012, the worst year on record for all home sales in Tallahassee, luxury home sales were 1,967% higher than they were in 1991.
Who can afford to buy a luxury home in Tallahassee? One can argue that inflation is one reason why there are more luxury home owners today than there were in the past. But I don't think inflation has run at a cumulative rate of 6,517% right? So something else has to be occurring. Either more people with "luxury home money" have moved to Tallahassee, or more people have earned the money to buy luxury homes, or is it something else? We know that job growth is still very slow and steady in town, as is population growth. And Tallahassee was not home to a bunch of mid 1990s Google investors that I know of. So I think we can conclude that a change in the wealth of thousands of people in Tallahassee is not likely the stimulus for the explosion of our luxury home market. Perhaps it's those low mortgage interest rates ... and the loan programs that were created and terminated from 2002 through 2006. Take a moment to really look at the graph above. When interest rates were at 9% (far left), very few people in Tallahassee could afford a home that costs $400,000 or more. Note how mortgage interest rates have generally fallen over the past 20 years. I believe this is the fuel for the luxury home market in Tallahassee (and beyond). The crazy buying of 2002 through 2006 is gone for good (those loan programs will not return), but low mortgage interest rates are somewhat sustaining the market for expensive homes. But what is going to happen when mortgage interest rates return to 9% and higher? I don't think we'll see the market return to fewer than 20 luxury homes sold per year, but I am very confident these levels will drop substantially (like fewer than 100 per year). Ask yourself, what will this mean to somebody who owns a $500K home and needs to move? The supply for high end homes is already so high that they are still falling in value. Can you imagine the impact of higher interest rates? The magic line on the graph indicates a rate hike above 6% might reduce luxury home sales by 50% or more. Wouldn't that create a supply and demand imbalance that would impact the market for 20 or more years? If high end homes drop in price (so they can be sold), won't that create a supply imbalance for homes price directly beneath the luxury home market? 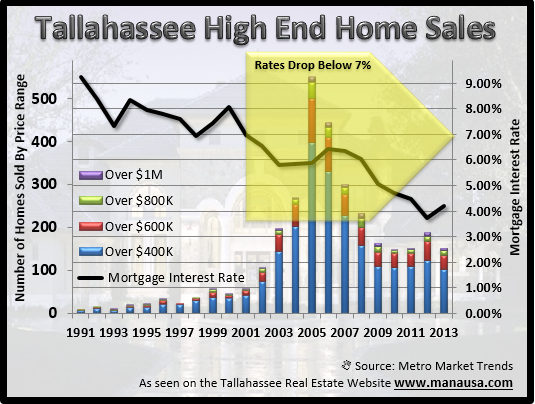 This "trickle-down" supply that will come from the expensive homes will impact Tallahassee greatly once interest rates start to rise and threaten the 6% level, and thus I think every homeowner should understand how and where they fit into the real estate food chain. If you think I've missed something, I urge you to leave a comment below to see if we can soften the message. And if you are somebody considering entering or departing the luxury home market in Tallahassee sometime soon, just drop me a note and we can show you how to make a better decision for your particular situation and needs. How Often Will A Home Seller Counter In Today's Market? Excellent analysis, Joe. There are a lot of parallels to my market in Stuart, FL as well. Thanks Gabe. That 's seems to be the input from most markets.